Jhansi Cantonment Board Recruitment 2016 – 21 Staff Nurse, Jr Assistant, Office Asst & Other Posts :- Jhansi Cantonment Board has released latest notification for filling up 21 Doctor, Staff Nurse, Lab Assistant, Assistant Teacher, Junior Assistant, Office Assistant, Plumber and other posts. Desirous & eligible candidates may apply online from 11/12/2015 to 10/01/2016. Age Limit: 18 to 25 years as 01/12/2015. Relaxation in Upper Age Limit : 3 Years for OBC Category, 5 years for SC Category & 10 years for PH Category. 01. Doctor (R.M.O.) : MBBS from a recognized university / medical college. Candidate must have registered with State Medical Council. 02. Hospital Manager : Degree in Hospital Management from a recognized university. 03. Staff Nurse : Four year Diploma in GNM from a recognized institute. Candidate must have registered with State Nursing Council. 04. Lab Assistant : Diploma in Lab Technician from a recognized institute. Candidate must have registered from State Medical Council. 05. Dresser : Matriculation from a recognized Board. 06. Chowkidar : Matriculation from a recognized Board. 07. Assistant Teacher : B.Ed or BTC from a recognized university / institute. Candidate must have passed TET conducted by the State Govt. 08. Junior Assistant : Intermediate from a recognized Board. Typing speed at computer keyboard (175 key depression per min in English OR 90 key depression per min in HIndi). Starting Date of Online Application: 11/12/2015. Last Date of Online Application : 10/01/2016. Application Procedure: Eligible candidates may apply online through website http://jcb.org.in from 11/12/2015 to 10/01/2016. 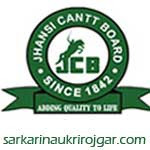 Subscribe our free job alert mail for Jhansi Cantonment Board Recruitment 2016.